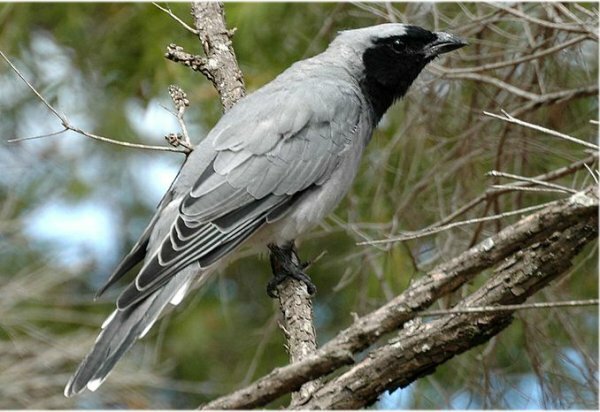 Our Beautiful World: Cuckooshrikes, Campephagidae, The smaller genera. Genus Coracina (48) Cicadabirds and Cuckooshrikes. and Campochaera) the trillers (Lalage), the minivets (Pericrocotus), the flycatcher-shrikes (Hemipus). Fruithunter was often placed in this family but has now been shown to be a thrush (Turdidae). The trillers, Lalage, are a genus of passerine birds belonging to the cuckoo-shrike family Campephagidae. cup-shaped nest high in a tree. They are fairly small birds, about 15 to 20 cm long. They are mainly black, grey and white in colour. Most species are fairly common but the Samoan Triller is considered to be Near Threatened and the Norfolk Island subspecies of the Long-tailed Triller has become extinct. 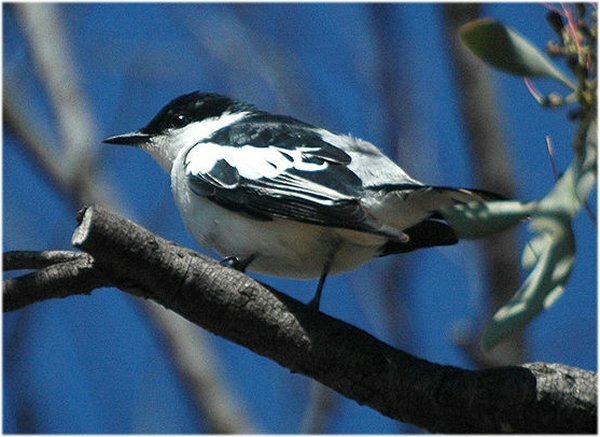 The White-winged Triller, Lalage tricolor, is one of the smaller members of the Cuckoo-shrike family, Campephagidae. 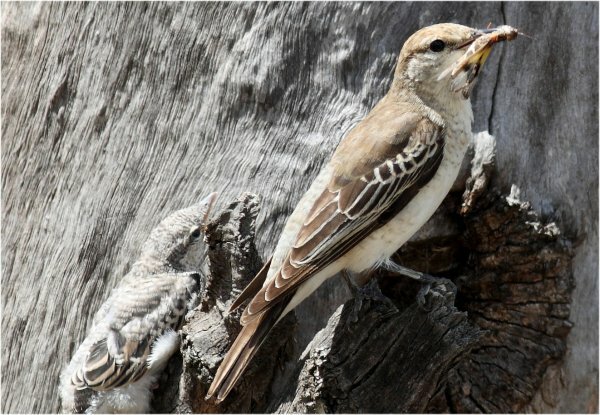 breeding migrant to the cooler southern parts of Australia. fluttering wings in song flight. to the female, retaining blackish feathers only on the wings and tail. in which case the White-winged Triller becomes Lalage sueurii tricolor. Small Minivet, Pericrocotus cinnamomeus malabaricus. Near Hyderabad. Asia from the Indian subcontinent east to Indonesia. like structure into which two to four spotted eggs are laid and incubated by the female. edges, rump and wing patches. 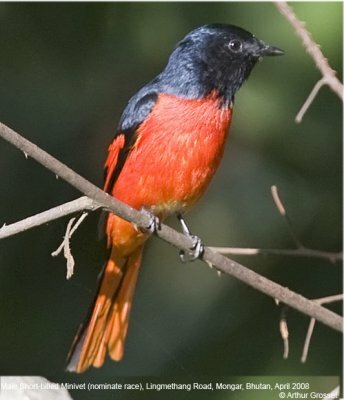 Small Minivet, Pericrocotus cinnamomeus malabaricus. Female, near Hyderabad. 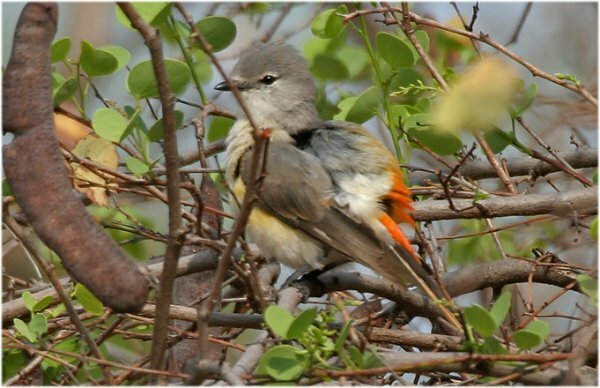 is pale grey above, with the underparts whitish except on the throat and flanks, whereas the male Pericrocotus cinnamomeus malabaricus of peninsular and southern India is darker above, has more extensive scarlet below. The female of the southern race is also brighter yellow below. 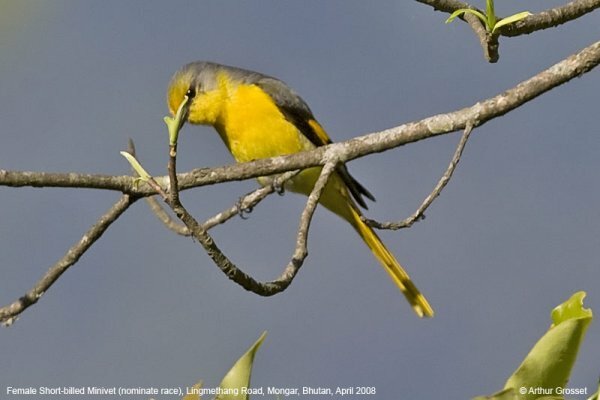 This minivet catches insects in trees by flycatching or while perched. 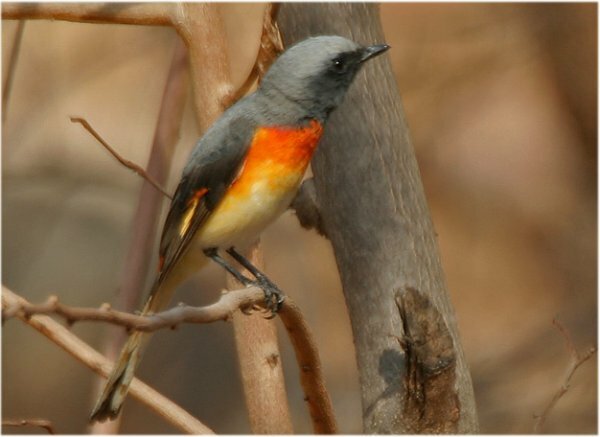 The Small Minivet will form small flocks. Its call is a high, thin swee swee swee. 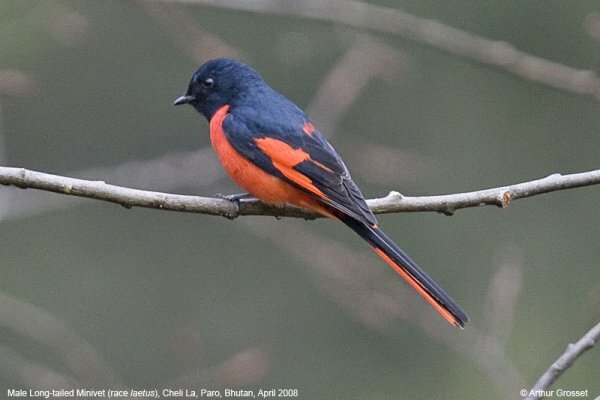 The Long-tailed Minivet, Pericrocotus ethologus, is a species of bird in the Campephagidae family. It is found in Afghanistan, Bangladesh, Bhutan, China, India, Laos, Myanmar, Nepal, Pakistan, Thailand, and Vietnam. Its natural habitats are subtropical or tropical moist lowland forests and subtropical or tropical moist montane forests. 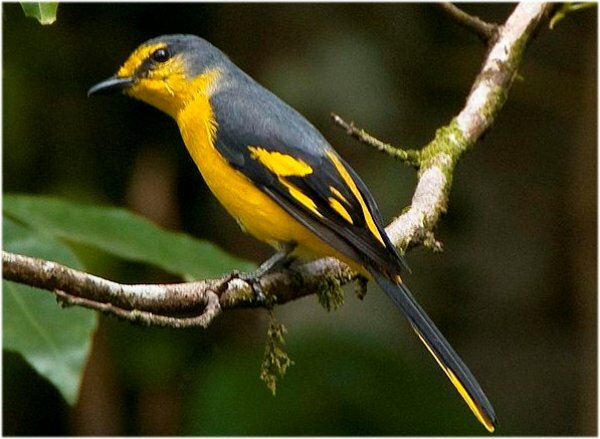 It is found in open forest at between 900 and 3650 metres during the breeding season. species foraging flocks, usually foraging in small groups, high up in the forest canopy. (including the face), tail edges, rump and wing patches. forest mainly on the edges and at between 900 and 2,745 metres. 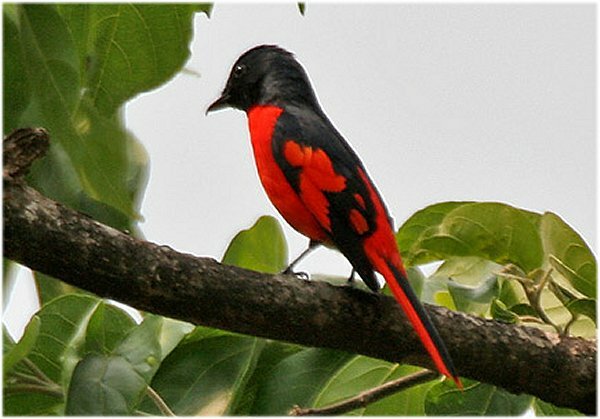 in the Scarlet Minivet Pericrocotus flammeus.